As technology and infrastructure improved, rivers became less and less important and more and more forgotten about. We look at 10 cities reconnecting with their rivers. 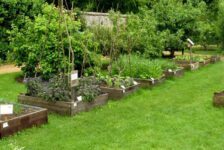 We are living in an era in which for the first time since the industrial revolution we are witnessing a complete shift in the way the relationship between the city and nature is represented in our cities. 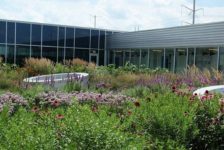 Architects, planners, landscape designers, artist, politicians and society are getting together to find ways to reintegrate nature into the cities through their often forgotten rivers. Some are pushing away infrastructure or rediscovering abandoned industrial riverside heritage to reintroduce nature and increase the quality of life of the surrounding areas. Other are taking it to a completely new level – thinking of a resilient future relationship with their rivers due to the present climate change impact. We have selected 10 cities that found a way to improve their quality of life and reintroduce nature back into the heart of the city through reinventing the relationship to their rivers. 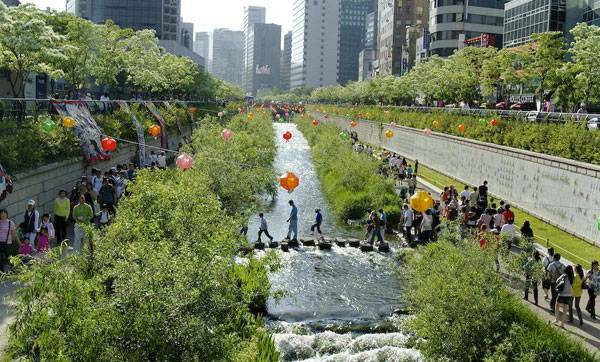 The intervention transformed the whole urban experience into a pedestrian friendly, river experience full of activities. The project was designed to address the different levels of the river throughout monsoon season and the rest of the year but is also seen a symbol of the future unification of North and South Korea. At the beginning of the 20th century, the banks of Ljubljanica River started decaying due to aging infrastructure and the construction of car purposed areas. The river flows directly through the old city center and the deprivation started having a serious negative influence on its vitality. 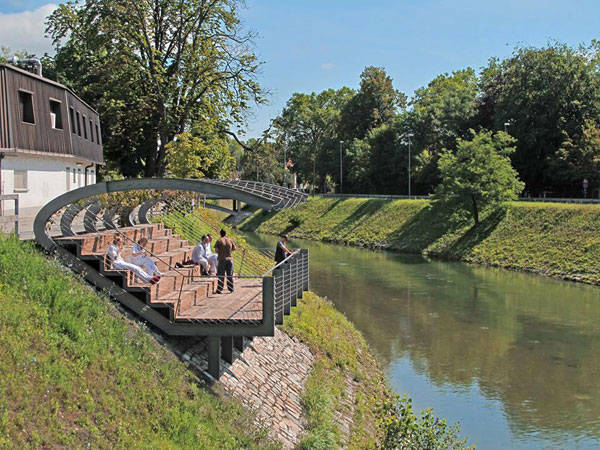 Realizing the risk of urban deprivation due to the low quality and inaccessibility to the river, the city council decided to invest 20 million euros in the redevelopment of a central portion of Ljubljanica River and recreate its forgotten benefits on the city’s quality of life. The result is a revived city center, additional public spaces by the river and reversing the tendency of urban sprawl evoked by the undermining of the natural qualities the river brings to the city. Before the completion of the West 8’s project in 2011 the Manzanares river was enveloped on both its banks by high-speed roads. Access to the river was impossible and its valuable recreation qualities buried for the sake of the car. RIO Madrid consisted of drastic measures to bring the river back to the city. The project cost skyrocketed at 280 million euros to bury the highway and create a stretch of public spaces, parks and bridges to give a new face to the river and recreate the link with the city. 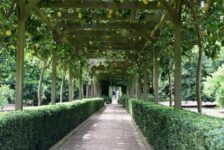 It has successfully proven to have increased the quality of life in all surrounding neighborhoods and become a major attraction public space for everyone in Madrid. Paris is one of the world’s densest cities, with an enormous protected by UNESCO World Heritage Site along the river Seine. 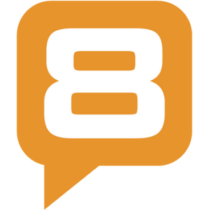 Its riverbanks became an automobile corridor in the 60’s when its right banks became exclusively reserved for cars. And it wasn’t until 2001 that the city authorities decided to introduce a temporary way to bring back Parisians to the river where in the past activities flourished and people lived with the river. 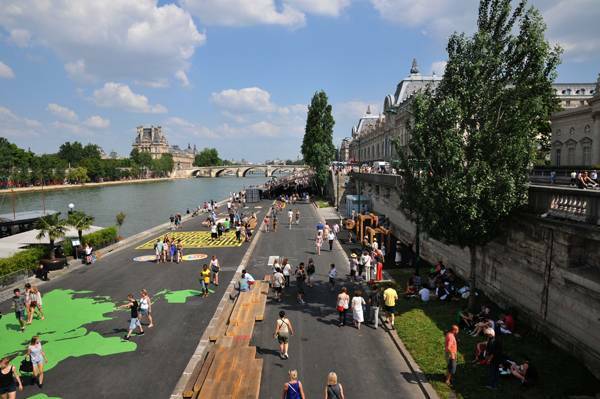 The initiative is called Paris plages and consists of closing sections of the lanes running along the river and transforms them into vital public spaces for a month. The success of this annually reoccurring project has pushed through the opposition and in 2012 the city closed large parts of the dedicated to cars banks and transformed them into permanent public spaces that are changing the relationship of Parisians to their river and increasing the value this world heritage site. In the case of this project, the river banks weren’t transformed from the industrial history but rather saved from the fast-growing urban development and given a new life with very little interventions. The Red ribbon park creation came just on time to handle the growing need for public space and encroaching urban development. Before its transformation, it was a rich natural environment which was though inaccessible and dangerous to be used for recreation activities. It was taken over as a trash dump by the adjacent beach town and unsecure due to the shantytown spread. 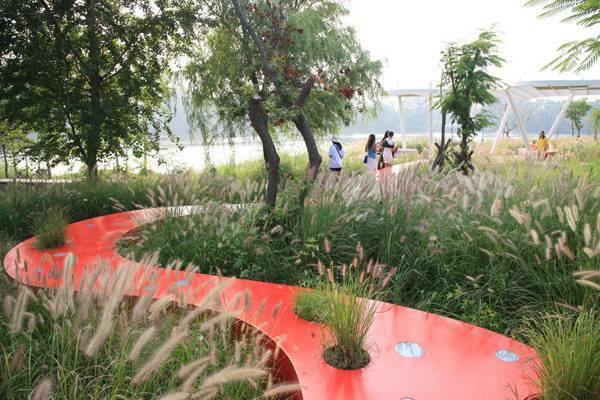 The major design element – the red ribbon runs through the whole park. 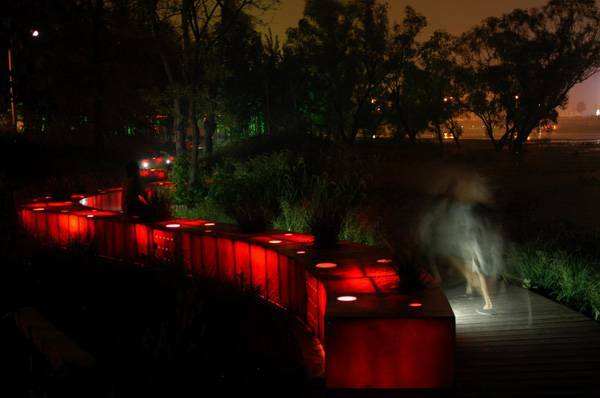 It was conceived to integrate lighting, seating and boardwalk as the design team was aiming at preserving the natural habitats while at the same time create opportunities for recreational activities. 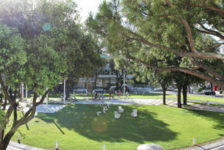 Since its completion in 2008 the surroundings of the park have urbanized and the population has higher demands for the maintenance of quality of the natural environment. The Red Ribbon Park responds to both the demands of nature and the public giving a place for them to interact safely. Rhone River’s history is similar to Bordeaux’s Garonne River, ruled by the automobile and port industry in the past. In 2003, the city council launched a competition searching to create a place along the river that brings people closer to nature and relate to the river while being a meeting place offering a variety of activities. 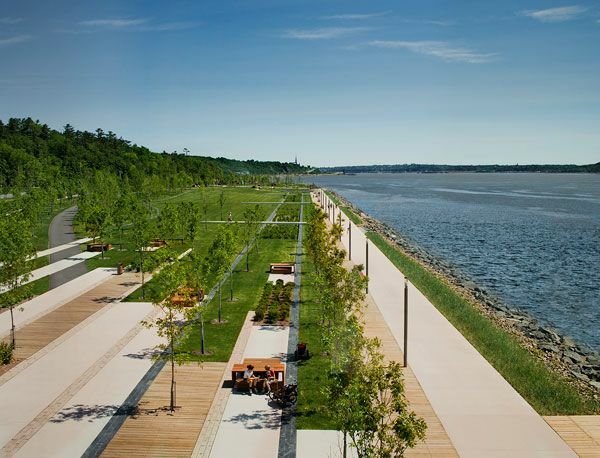 In situ Architectes Paysagistes developed the winning proposal for the redevelopment of 5km of parking spaces and high-speed lanes into a riverfront landscape integrating a variety of activities all along. The Lyon River Bank. Credit: IN SITU Architectes Paysagistes. 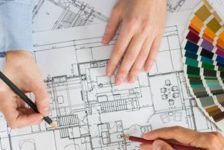 During the design process, a major input was taken from the community participation to assure the final result responds to all needs of the city. 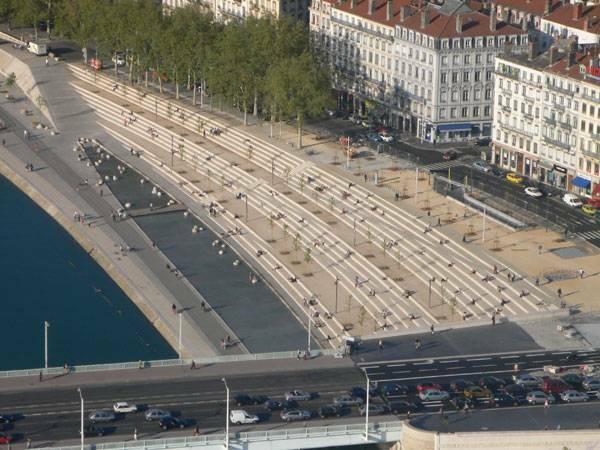 Now it offers fishing points, bike rentals, relaxation points, public spaces, a major element – the steps terrace at the Guilloètire bridge as the entrance to the old city center. Parking and cars are banned from site allowing only cycling and walking as the stretch is also a part of the European cycle path running from Geneva Lake to the Mediterranean coast. 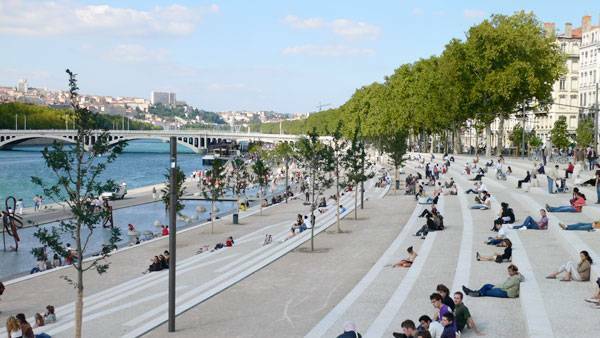 The project was completed in 2007 and immediately became a preferred place for Lyon’s inhabitants linking the city to the river and creating a new relationship with the Rhone. As many of the listed cities, Bordeaux’s Garonne river banks were previously devoted to industry. On the left riverbank of the Garonne River in the 1700s, the “Port de la Lune” was located together with a stretch of 4.5 km of adjacent industry along the river right next to the city center. At the beginning of the 20th century, the industrial activities were abandoned and taken over by parking spots. By the year 2005 these ex-industrial areas had no sense of space or meaning. That is when the city saw the potential of transforming it into a vital public space to invite the river back to the city and the people back to the river. In the core of the project was first the creation of a tramway in order to leave more space for pedestrians along the river. Once that was achieved the Major of Bordeaux wanted to create a connection from the river to the adjacent neighborhoods and the opposite banks of the river. He chose the proposals of Michel Courajoud whose aim was to keep the sense of port in a new urban reality achieved by preserving the elements of the old port into the design. With the beginning of the clearance of the area for the construction works people instantly started reaching to the river as “they felt naturally drawn to water” says Courajoud. The most famous feature of the project is the “water mirror” which is the largest reflecting pool in the world. Completed in 2009 these new public spaces have increased the quality of life and provided a completely new urban experience – one close to the river. You can see this project in more detail here. 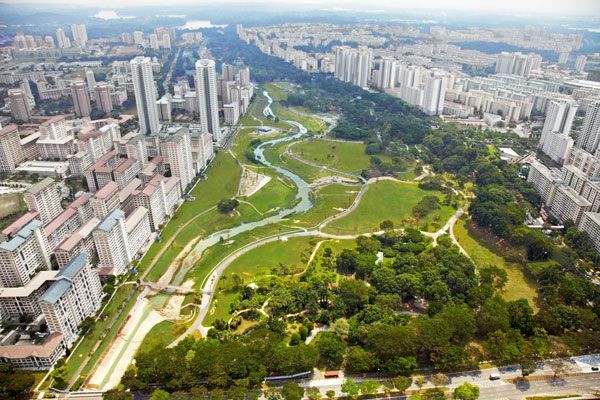 The project to transform the Kallang river park emerged from the necessity to find larger flood capacity of the canalized Kallang River but also from the initiative of the city to enrich the drainage functions of the canals. 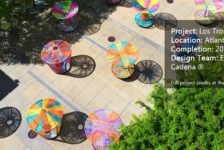 The project is part of “ABC water” – coming from Active, Beautiful, Clean waters aiming to create vibrant community gathering spaces accommodating the drainage functions of the river at the same time.